Play Urgum's SPOT THE SOUND EFFECT GAME! He's so tough he thinks nothing of catching cannonballs in his mouth and putting cobras down his vest. I wish I was a kid again because I would have loved this book. I can't remember there ever being books as side-splittingly, belly-wobblyingly, head-in-risk-of-falling-off funny as this when I wore short trousers. 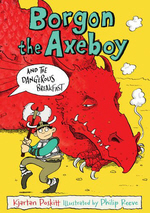 It's a gloriously wordy and irreverant, historicaly-innaccurate riot with Philip Reeve's illustrations expertly adding more laughing gas to the mix. What a great team Poskitt and Reeve are. This is a fantastically unique story, drenched in humour. The characters are vibrant and strong, and compel the reader onwards to see what they will do next. It is one for the boys (and the Molly-like girls), and is a whole load of fun. Sarah Merrett, School Librarian Magazine - Spring 2007 WHERE did Kjartan Poskitt find Urgum's axe? Look out for URGUM... it's fun all the way. Urgum, Molly, Mungoid, Divina, Grizelda, the Gods and the Seven Savage sons are all back with gorilla/budgie creatures, flying hippos, a barbarian in a wedding dress, the Wandering Jungle and ... the Flaming Pants of Shumbitt! Barbarians with lampshapes on their heads? Spooky Tunnels and the Forgotten Crater? Awesome baby gods and the cursed princess? Very smelly trousers and a Giant Peligantuan? They're all in here! 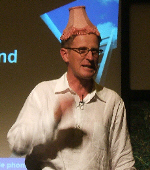 Philip Reeve wearing Urgum's lampshade at Edinburgh Book Festival, August 2008! 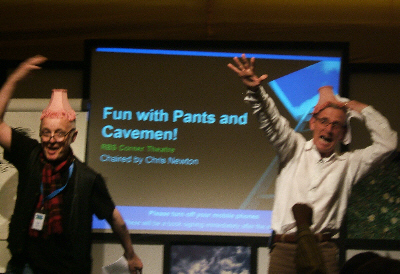 at the Edinburgh Book Festival in August 2008! Edinburgh Book Festival in August 2006. Click on the covers to order your books from Amazon!